WASHINGTON, United States (AFP) - US President Donald Trump and his allies in Britain and France on Saturday (April 14) hailed their joint surgical strikes in Syria over the regime's alleged use of chemical weapons, and warned Damascus that another such attack would be met with renewed firepower. Both the regime of Syria's Bashar al-Assad and its ally Russia have denied all responsibility. Moscow slammed the "aggressive actions" of the Western coalition, but has not yet responded militarily. "I spoke to the president this morning and he said: 'If the Syrian regime uses this poisonous gas again, the United States is locked and loaded,'" Haley said at emergency Security Council talks. "When our president draws a red line, our president enforces the red line." "A perfectly executed strike last night," Trump tweeted early on Saturday, thanking France and Britain. "Could not have had a better result. Mission Accomplished!" Trump drew some criticism for his choice of words: former president George W. Bush notoriously stood on an aircraft carrier just a few weeks after the initial Iraq invasion in 2003 in front of a "Mission Accomplished" banner. "We met our objectives. We hit the sites, the heart of the chemical weapons programme. So it was mission accomplished," Pentagon spokeswoman Dana White later said. 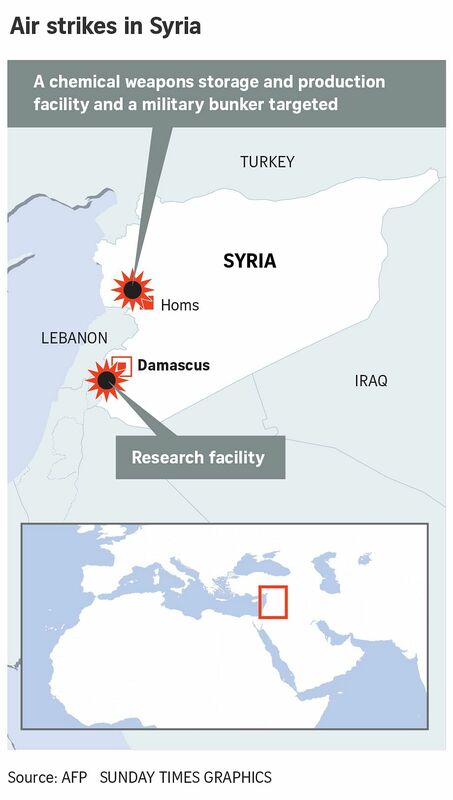 The targets included a scientific research facility near Damascus, and two chemical weapons facilities outside the city of Homs, the US military said. The facilities had, however, reportedly been evacuated in recent days. Syrian state media reported only three people injured, while Russia's defence ministry said there were "no victims" among Syrian civilians and military personnel. A top Pentagon official, Lieutenant General Kenneth McKenzie, said the action would set back Syria's chemical weapons program "for years." The strikes were the biggest foreign military action so far against Syria's regime. Trump, who announced the start of the joint strikes late on Friday, called the Douma attack the "crimes of a monster," referring to Assad. "The three leaders agreed that the military strikes taken against the Syrian regime's chemical weapons sites had been a success," Downing Street said in a readout of the calls. "By working together, in a coordinated fashion, we can definitively prevent the Syrian regime from carrying out chemical attacks against its own people," Macron said on Twitter. "This aggression will only make Syria and its people more determined to keep fighting and crushing terrorism in every inch of the country," he said. Assad's key ally Iran also slammed the attack, with supreme leader Ayatollah Ali Khamenei describing Western leaders as "criminals." The Russian military claimed Syrian air defence systems had intercepted 71 Western missiles, though the Pentagon flatly dismissed the claim and said all missiles hit their targets. In central Damascus, dozens of Syrians arrived on bicycles, on foot and in cars spray painted with the red, white, and black colours of the Syrian flag, blaring patriotic tunes. "History will record that Syria shot down missiles - and not just missiles. It shot down American arrogance," said Nedher Hammoud, 48. "Assad won't collapse. They'll bomb for a day or two and then the regime will take it out on us," he said. UN Secretary-General Antonio Guterres asked for restraint on Saturday. "At this critical juncture, I call on all member states to act consistently with the charter of the United Nations and with international law, including the norms against chemical weapons," he told the Security Council. An effort by Russia to secure UN condemnation of the strikes failed in the Council later in the day, only winning three of the nine votes needed for adoption. French Foreign Minister Jean-Yves Le Drian said Saturday that Paris would "take the initiative" within the Council from Monday "to make sure that we are moving towards a peaceful settlement of the Syrian crisis."